confidential nature of such projects, no pictures or descriptions can be posted. There is one project however that I can put up for public viewing. 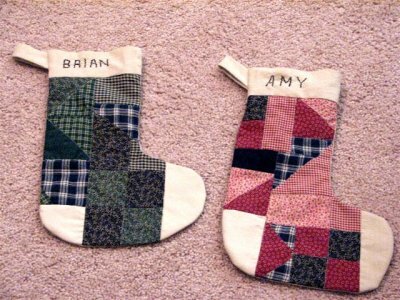 I just finished making our stockings! I used the same fabric that is in our quilt and I really like how they turned out! Now let’s just hope Brian can be good enough until Christmas to get something in his!